O-Pee-Chee came out about a week ago, but I've been very busy lately with other projects. It's great, though, to just sit down with it and crack open a box. From what it looks like, OPC has some interesting new things in it to go along with its usual inclusions. I'm curious if the new cards will inject some excitement into this long-standing brand. OPC is known for its retro themed massive base card set. The set has typically been 600 - and that's no different this year. The first 500 cards make up the regular set with the final 100 cards being rookies or legends. This year's base card design frames the player quite nicely. The card looks like a picture frame of sorts and has a golden shine to it. Everything is laid out neatly here with a generous photograph for the brand. Photo quality has never been a strong suit for OPC, and sadly that continues here. You're really just going to find run-of-the-mill pictures as you look through these cards. So while I like the size of the photos, I wish better ones were used. 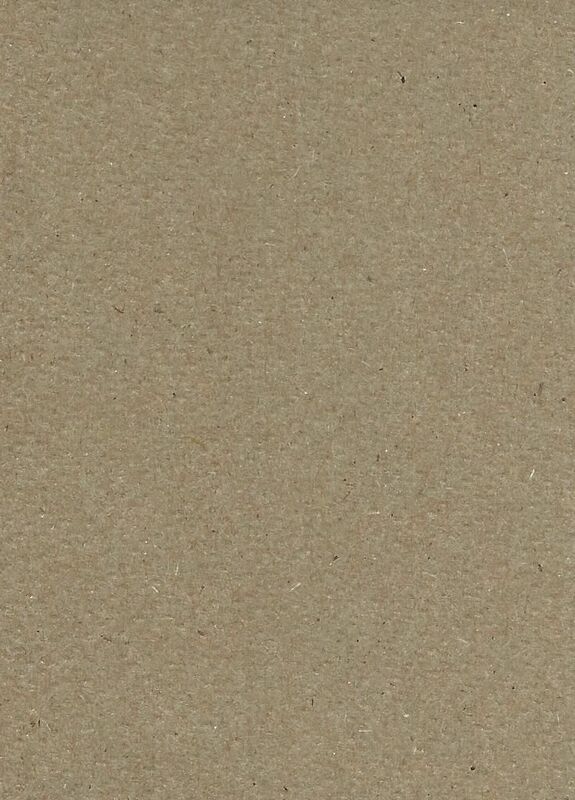 The OPC card back has the familiar cardboard look and feel to it. Design-wise, it's done very well with easy to follow text. I just wish the backs were more fun! Since OPC is a lower-end brand that kids can afford, it would have been nice to have some fun graphics and facts on the back for kids to read and enjoy. I always loved old Topps baseball cards for that very reason... they were fun! These cards are very stiff in comparison. 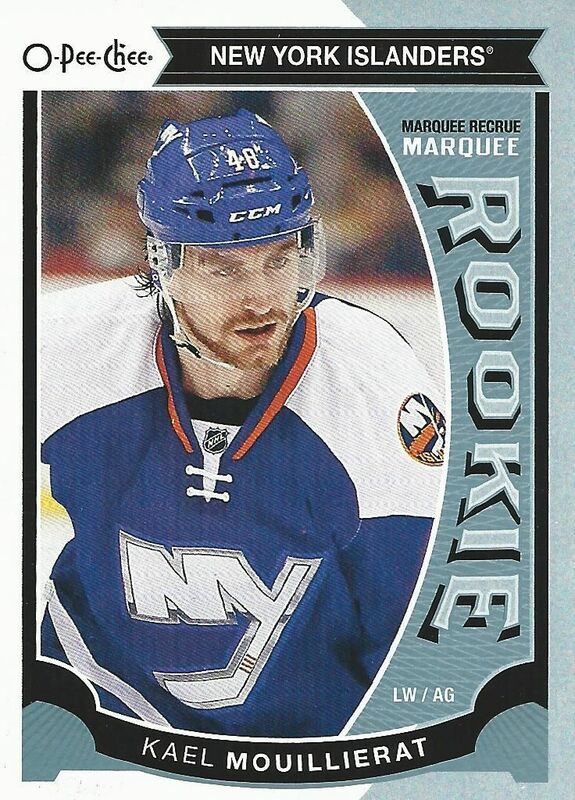 Rookies that got ice time last year but that didn't get a card have official RCs in this set. 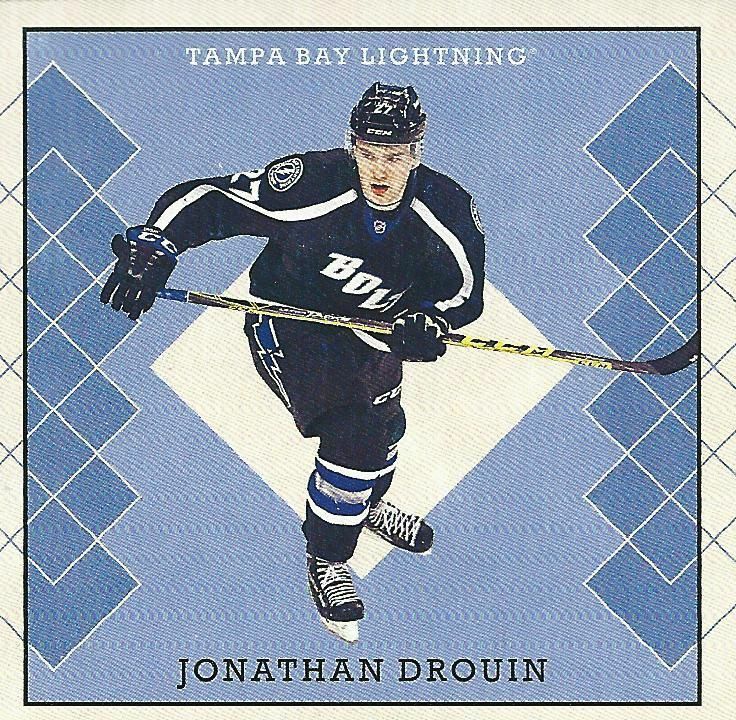 The rookies have a nice ice-blue look to them and are easily recognized as rookie cards by the large 'ROOKIE' logo on the right hand side of the card. It's usually pretty hard to find a big time rookie in these early season releases... and that case holds here. 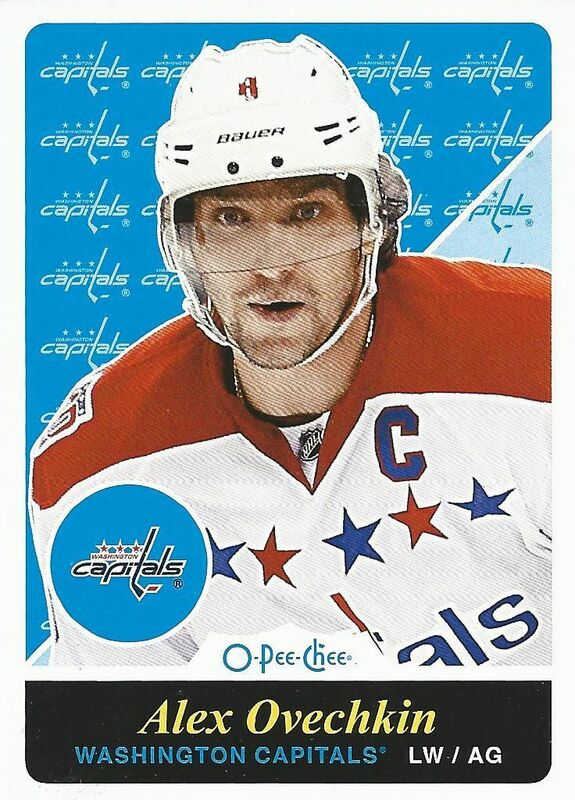 Upper Deck will most likely have updated OPC cards released as inserts in Upper Deck Series Two. 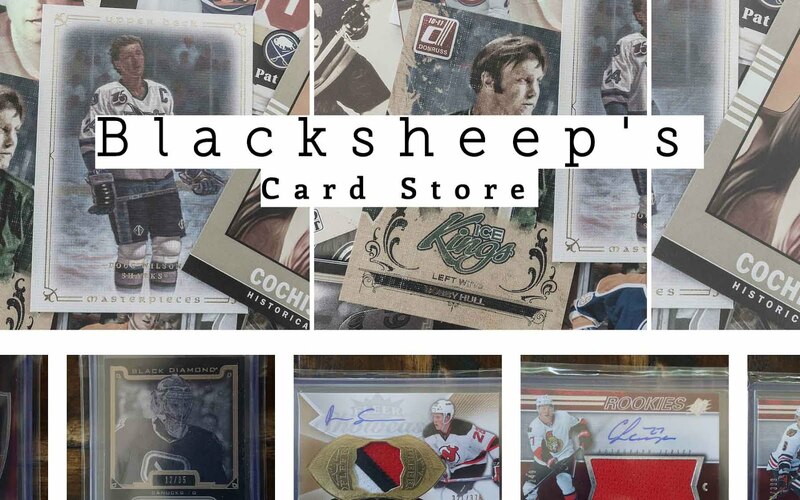 Upper Deck loves to fill out their OPC sets with cards of legends. 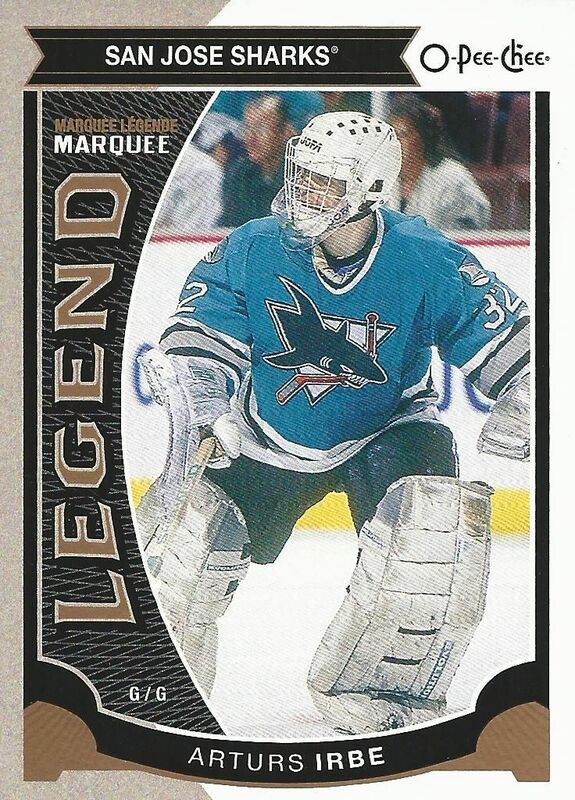 Usually you see the same bunch of guys over and over, but I was happy to see Arturs Irbe make the cut this time around. 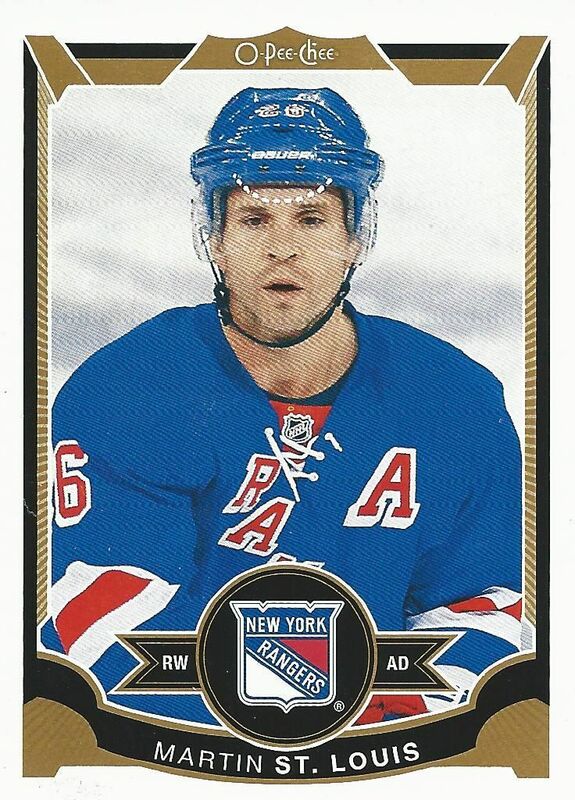 He's actually been in more Upper Deck products recently. 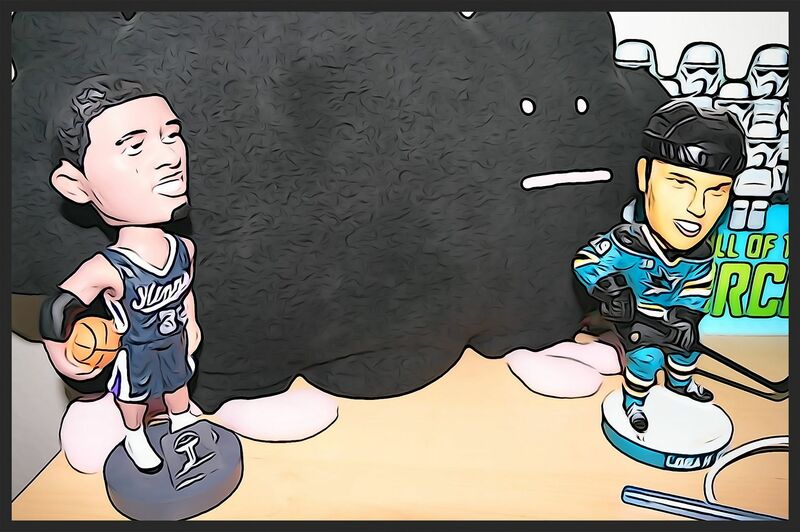 As a Sharks fan, that's awesome to see! OPC is a brand not known for its hits. In fact, unlike many products out there today, OPC does not guarantee any type of hit in their boxes... and are actually pretty difficult to come by. While OPC is a set builders brand, collectors can still find some nice inserts, parallels, and hits as they bust open their boxes of this product. Back once again are the OPC Retro parallel cards. These cards employ an even more retro design than the standard base cards. The design of these cards are pretty hit or miss most years. This year's effort isn't the greatest in my opinion. The design doesn't really remind me of anything old and just isn't bold or fun enough. I can't see much collector interest in there... unless you are super hard-core into OPC. Rare blank-back parallel cards exist in the product. Though these cards are considered pretty tough to find, I always seem to find some each year. The blank back parallel cards are always a bit of a challenge for player collectors to track down. Even though these cards may be hard to locate, recently they haven't sold for too much - which is nice for those on the lookout for them. 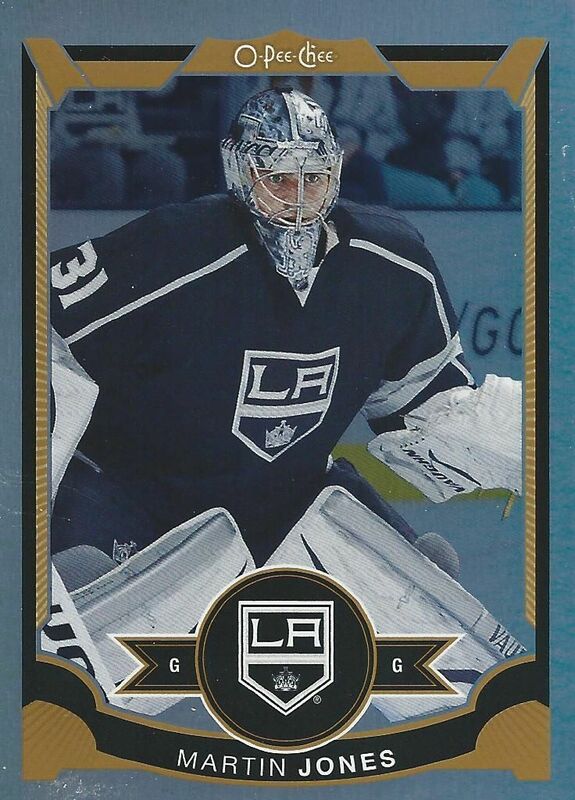 Continuing on with the foil trend, shiny and glossy base parallels also make a return to the set. These cards are certainly glammed up compared to the regular base card. They really stand out and I think are enticing to younger collectors who can't get enough of the shine. Black foil cards kick it up a notch by adding serial numbering on the back. These cards can be distinguished by their black borders. The cards are numbered to 100 copies each. You should find a couple per hobby box. Fans of smaller cards will like these square looking retro cards. They are not parallels of the regular set, but a standard insert. These cards page homage to the days when cards came in all different shapes and sizes. To me, these cards are hard to collect as they don't quite fit well with everything else I have. Baseball collectors seem to really like them though. It's a pretty polarizing type of card. All-Star insert cards are back. All-Star cards were really popular in the 90's, and these inserts definitely have a 90's glossy feel to them, so they are very appropriate. I actually like these cards quite a bit. The neon green look of the card is just something you don't see everyday. It might be my favorite looking card in the entire set. Probably the most interesting card I pulled out of my box was this puzzle redemption card. Now here's an idea that really comes straight out of the past. 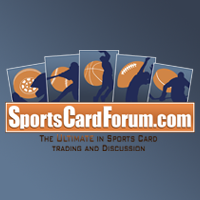 The thing is you have to get all the redemption cards and then mail them in for a special card of the number one pick. 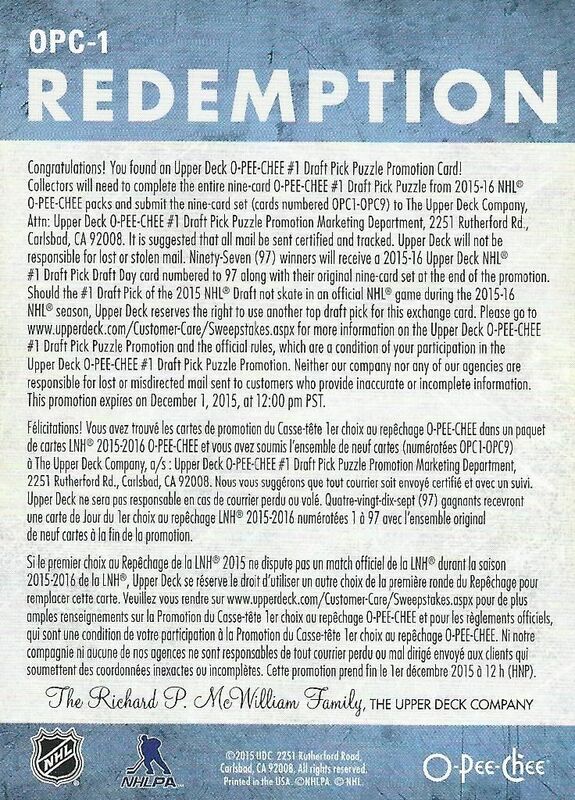 This is a really fun idea and can create buzz for the redemption card. There are nine of these cards that you have to find and they come once in everyone one-hundred packs or so! So they're not the easiest thing to get! I have yet to decide if I want to go for this redemption or not. Sadly, I didn't get any hits in my box, but I was excited to get the redemption card. It is a really unique idea that shows that Upper Deck is still trying to innovate on some level. There is actually quite a bit more to find in OPC as other insert cards have very long pull rates as well. Who knows, maybe I'll find some of those cards when I do some blasters of this when I find them! I am so glad that Upper Deck has made OPC a little more interesting. 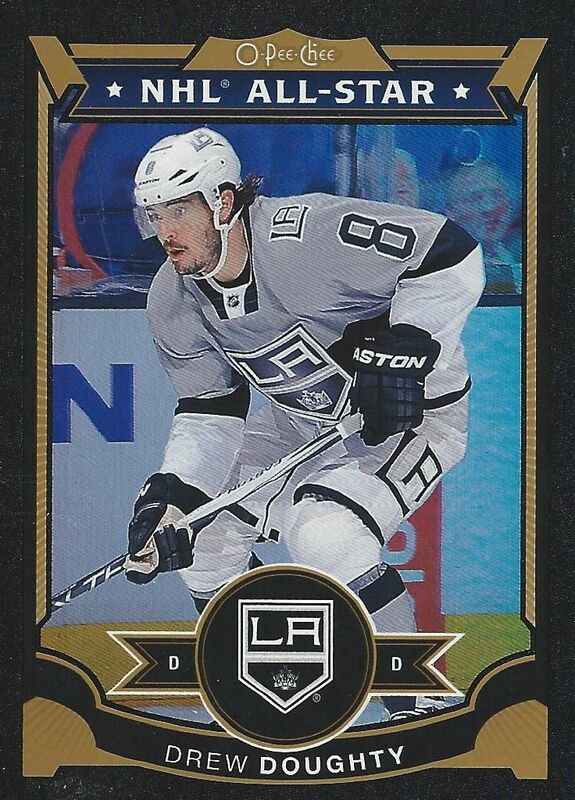 For the really high-rolling collectors, this may not be enough change to get them excited, but for many regular hockey card fans, this does make OPC just that much better than it was before. It is still a very affordable product that all fans can enjoy collecting. OPC won't bring you many cards that will blow you away, but it still has the ability to net you something worthwhile. I definitely recommend giving OPC a try this year and seeing what interesting cards you can pull out of it! Nice break I heard that those puzzle pieces go for 30 bucks each can you subscribe to my channel . Nice box! Cool McDavid redemption card. I really like the insert cards and nice box! I like the black cards, they look cool. It was a nice product for a lower-end one, and there were some nice inserts too! Solid review as usual Luke! Nice assortment of inserts of different tiers. As others have mentioned, the secondary market for the puzzle pieces is still going strong (for the time being, until all 97 cards have been redeemed) and 'might' be worth your time to look into that should you want to recoup some of the cost of the OPC box. They got rid of the Stickers and replaced them with the All-Star cards... not a bad idea I guess, they have to renew the product a bit. 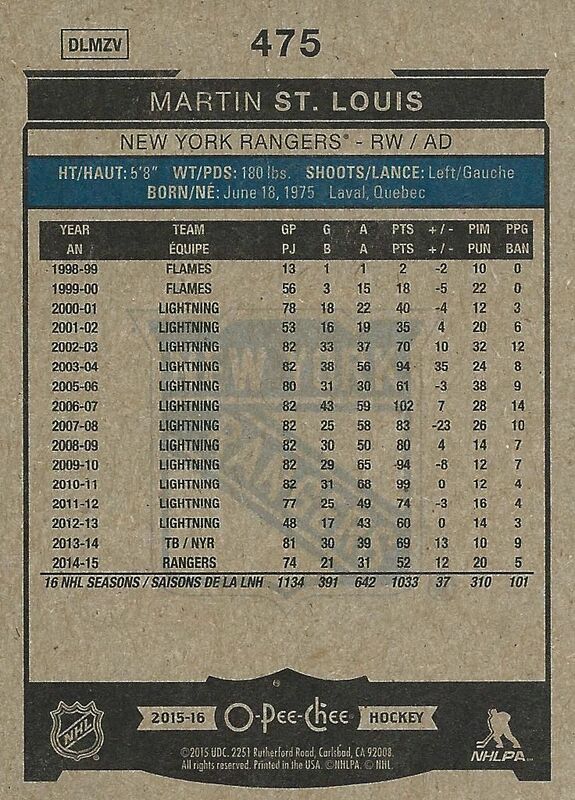 I think you got more foil that you should have (if we compare to previous years of O-Pee-Chee). Fun to open and accurate review. 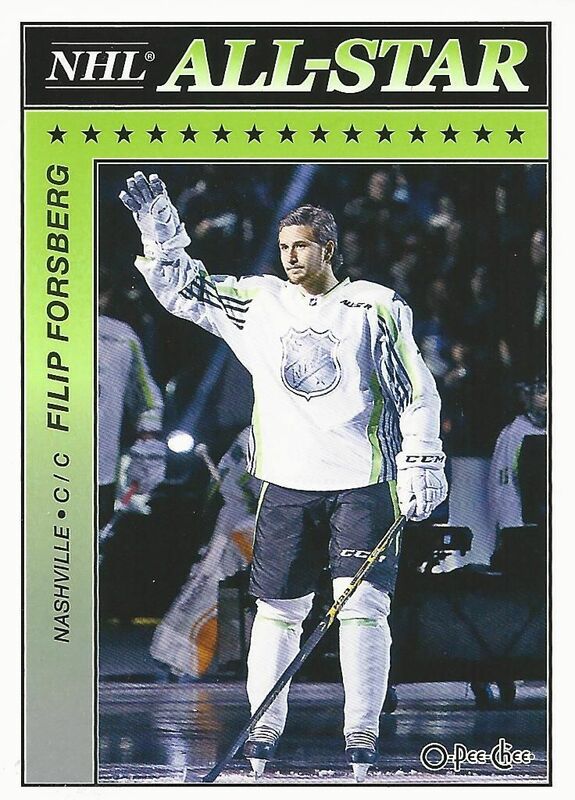 Really like the NHL All Stars cards! Nice break, keep it up ! The redemption is a cool idea. + The retro design is always appealing, if you keep it to one product/year. + The foiled cards, and especially the black ones, look pretty good. - Since there's almost impossible to get a "hit" out of the box I think the price could be even lower. - I don't like the design of the All Star cards at all. It looks like they have been made in Microsoft Word or something like that, and I don't think they fit into the product at all. great box. need to buy one. RRB Exam result from RRB Result 2016 website. There will be many who await for the sarkari result 10+2. Until then websites like this will help them to a great extent to update the current updates for the upcoming exams. Hey guys, wanna to get information about the Government Vacancies. Find here your search. Are you waiting for CG Board 10th Time Table 2017. Results will be releasing soon. Are you waiting for PUC Results 2017 .Results will be releasing soon. Thanks for providing this informative article on your site. Looking For RRB Mumbai Group D Result? Look no more. Here, we are, providing the all RRB Result, may it be Group D, ALP, and RPF right, at one place at railwayresult.in. So, keep yourself updated with RRB Result. Thanks for the post, check here for Cricket World Cup 2019 Teams.